Forget the daffodils, Southern Californians know it's spring when the annual Pasadena Designer Showcase House for the Arts (PSHA) opens its decorated doors to the public. 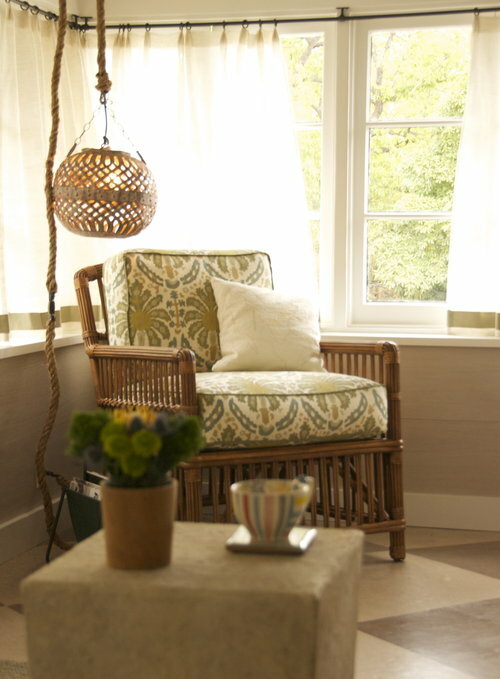 Style Anthropologist and freelance writer for home, design and lifestyle media. 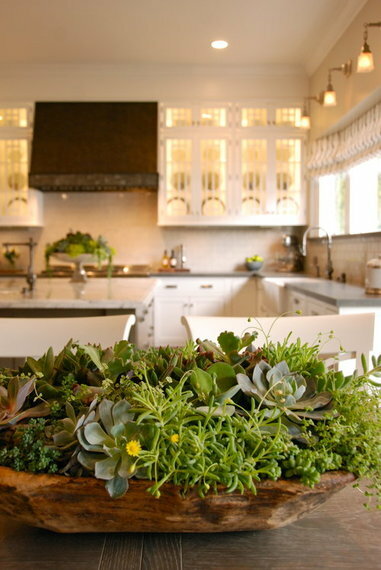 Forget the daffodils, Southern Californians know it's spring when the annual Pasadena Showcase House of Design (PSHD) opens its decorated doors to the public. We celebrate the bulbs...from energy efficient to decorative filament; expect showers -- with swoon-worthy tile; and revel in fresh flowers -- on everything from wallpaper to window coverings -- it's a seasonal rite of passage that has been a tradition for the past 51 years. This year, the tour takes place April 19-May 17 in a 1910 English Tudor estate with Arts and Crafts elements designed by Fernand Parmentier. Featuring a 9,400 square foot main residence and 2,600 square foot carriage house, the estate has been thoughtfully renovated by regional designers who competed for the opportunity to showcase their skill. Over the years, kitchens have morphed from areas of isolation and drudgery into modern day family rooms. 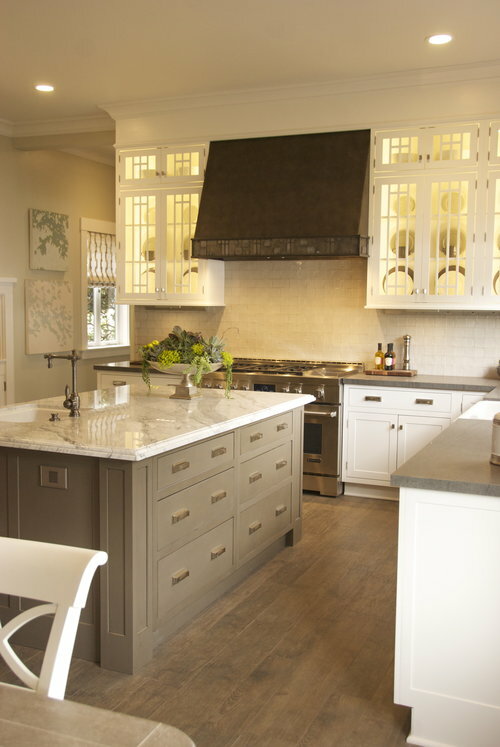 This year's showcase kitchen designed by Cynthia Lambakis and Samantha Williams, partners at the Ederra Design Studio in conjunction with Jan Ledgard at Yorkshire Kitchens took cues from the home's original era while updating the space with modern style and amenities. Kitchen appliances including a built-in steam oven, instead of a microwave, and a French door refrigerator with black interior, both from Jenn Air. " The steam oven is a fairly new product," says Williams, "a lot of people are choosing them to replace microwaves...this is a really healthy way to reheat and reconstitute food." 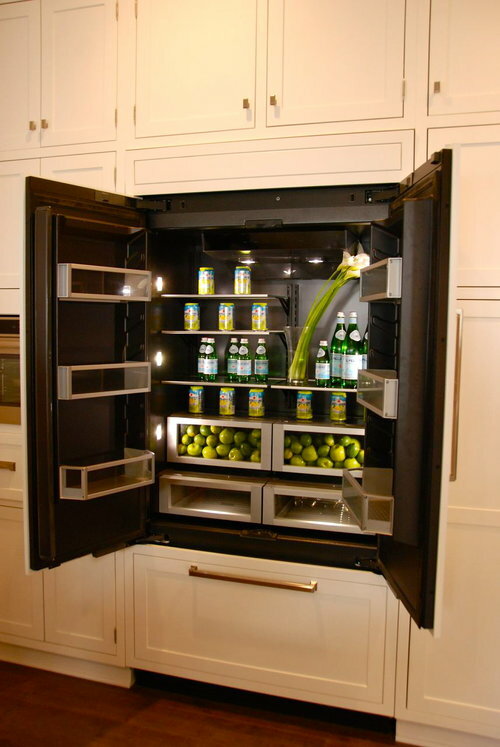 The black interior of the refrigerator is a brand new style for luxury appliance manufacturer and one of the designer's favorite touches. "Some people think things will get lost inside [a black] fridge, but you can actually see glass more easily. Glass containers and colors really pop, so with the white cabinets it's a really nice contrast." Another favorite touch: electrical outlets that disappear into the wall when not in use and "pop out" with a gentle touch into 3-D cube with triple sockets when needed. In the carriage house kitchen, renovated by G.H. Wood Design, the deep, stone composite sink comprised of cement and jute from Native Trails was new and noteworthy. "I was originally going to do stainless steel," explains designer Kaleena Khademi, "but then I saw this -we wanted the look to be warm and inviting." Don't miss it. Great design is in the details, and it was worth noting that more and more of those details are in gold, brass, or bronze. In the butler's pantry, designed by Ederra Design Studio and Yorkshire Kitchens antique brass hardware gleamed against navy blue cabinets; while upstairs in the girl's suite, gilded faucets and fixtures accented bespoke furniture and custom chandeliers in a princess-worthy design by Gail Sedigh at AFK Fine Furniture for Children. 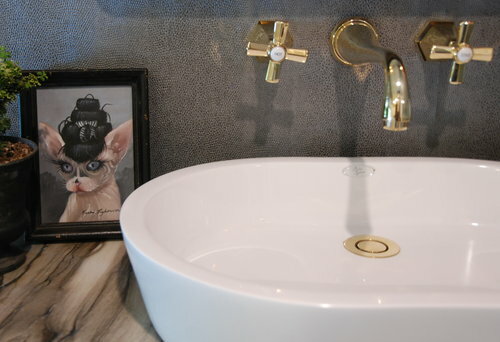 The Guest Bathroom in the carriage house also incorporated the warm luster of brass. "Brass and gold is all coming back," said designer Jason Lai of L2 Interiors who designed the space with his partner, Stephanie Leese. "I think the new thing coming in is going to be rose gold," predicts Lai, "I've seen some [great examples] and it is beautiful." In keeping with the serene elegance of the estate many designers used a neutral palette as the basis for their space -and this year, the winner was gray by a mile. Good bye taupe, tan, sand and beige, hello fifty shades. Paired with white, the look is clean, crisp, fresh and modern while remaining undeniably classic. "Gray is definitely having a moment," said designer Dana Triano of Dana Triano Designs. She used the combination to create a sense of light and space in the artist's retreat (shown here) painting it on the exposed beam ceiling and cork floors of the sleeping porch. One of the first things you see when you walk into the home is an original fireplace faced with vintage Greuby tile -foreshadowing the inspiring work ahead. Porcelain tile you would swear is hard wood by Walker Zanger was used for kitchen flooring. "A lot of people are very hesitant to put a hard wood floor in their kitchen," explains Williams, "because if they have an appliance leak they have to replace the whole thing. This gives you the warmth of the wood look, but the durability and cost of porcelain." Williams and her partners were also excited to premiere new Walker Zanger's tile designed by architect Robert A.M. Stern on the kitchen walls and backsplash that paid homage to the Craftsman style era of the house. 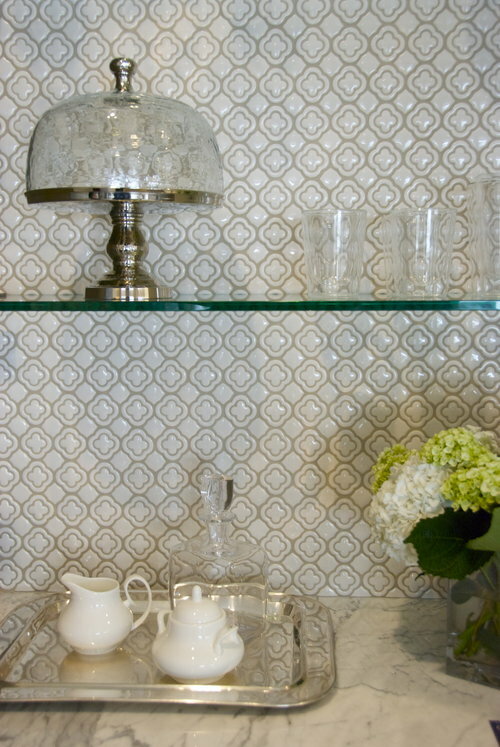 Gray subway tile incorporates the influence of Frank Lloyd Wright, while period-inspired tile with a quatrefoil pattern was used above the coffee station. 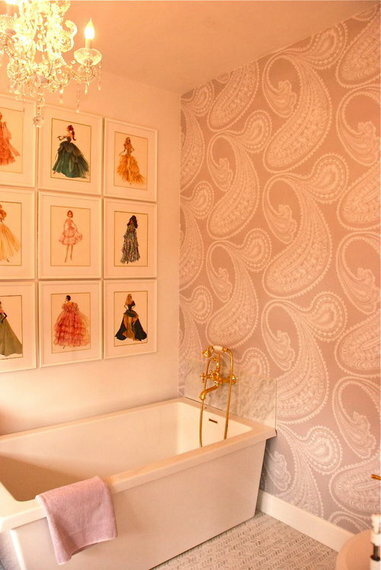 Designer Stephanie Laney of Surfaces USA designed the upstairs bathroom with dramatic use of tile. 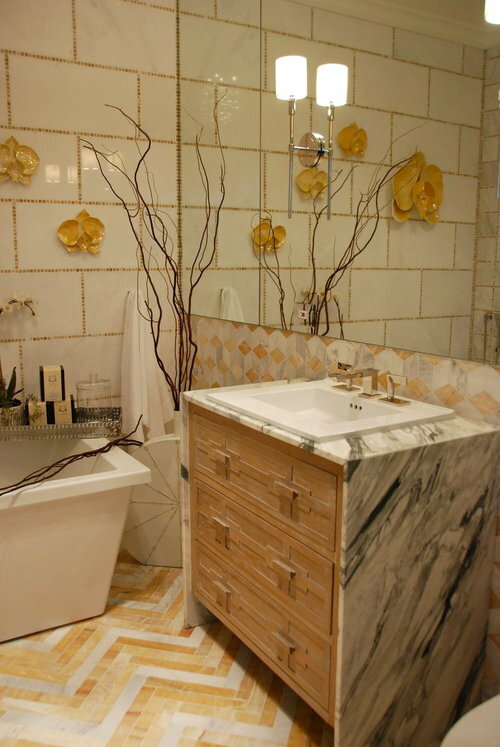 Inspired by the colors of wall mounted ceramic orchids over a deep soaking tub, the room was designed with geometric patterns of hand laid tiles in honey onyx, white and gold mosaics. In the carriage house, G.H. 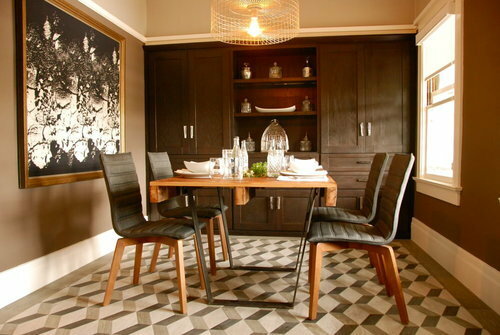 Wood Design team's use of Walker Zanger optical illusion tile on the dining room floor is a showstopper. In the same building, the large shower in the guest bathroom features elegant, 3D style tile that designer Lai says has waterfall-like properties when the water runs. Finally, don't miss the horizontal slit of a drain at the bottom of the shower. Clean (pun intended), chic style. Statement beds played starring roles in bedrooms throughout the estate with daybeds, romantic four posters, curtained canopies and suspended sleeping platforms providing dreamy ideas for discerning slumber. The upstairs boy's suite features a custom bed suspended from the ceiling (and interior beams) by industrial steel pipes. Hewn from walnut and hand brushed to achieve texture the bed was built by Concept Builders and accessorized with LED lights on the underside. The lights are attached to motion sensors to assist with midnight raids on the kitchen. A custom, built-in daybed in the writers retreat by Robert Frank Design offers the ultimate in cozy escapism and threatens any productivity said writer might hope to achieve. 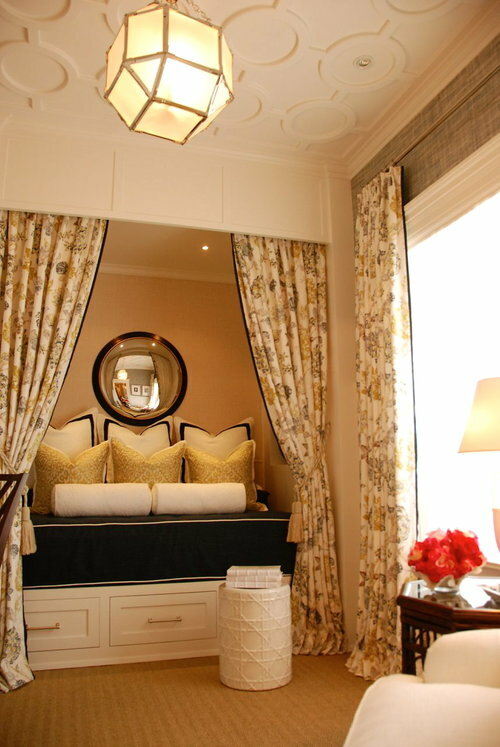 The girl's suite, Sedigh offers the kind of bed every aspiring princess dreams about. Draped in pastel curtains of silk velvet, it's a fairytale fantasy come true. Tickets $35 - $45 online to PasadenaShowcase.org. All photography c. Bonnie McCarthy 2015.